Some anime get the adrenaline pumping. Others tug at the heartstrings. Some are mindless adventures while yet others make you think. And then there are those like Amagi Brilliant Park that are just fun for the sake of fun. One day, high schooler Seiya is asked out on a date by Sento, the new girl at school. On one hand, this makes sense to the incredibly narcissistic Seiya. He is, after all, both the top of his class and incredibly handsome. On the other hand, she asks him out at flintlock-point—threatening to kill him if he doesn't take her to a notoriously run-down theme park: Amagi Brilliant Park. Going half out of fear and half out of curiosity, he sees the park is even worse off than he had thought. It is then that he learns the truth: All theme parks in our world are actually a way for fantasy-esque parallel worlds to gather magical energy from human happiness. Amagi Brilliant Park in particular is staffed by refugees of one such world who count on the park's energy to survive. Moreover, after several years of underperformance, the bank is set to foreclose on the park—that is unless the park can reach its yearly quota of 500,000 visitors in the next three months. Of course, wondering what all this has to do with him, he gets the true bombshell: Sento and the park's owner (a princess from another world) want Seiya to become the park's manager—for it has been prophesied that only he can save Amagi Brilliant Park. To say that Amagi Brilliant Park's premise is unique is a bit of an understatement—and the series uses it to its fullest possible extent. In truth, the episodes are rarely focused on directly saving the park and instead use the park as a setting for various adventures. One episode involves Seiya and various members of the park's staff stumbling upon a long-abandoned fantasy-adventure attraction where they are attacked by orcs and even a dragon as they try to make it through the dungeon's traps. Another follows the theme park's inhabitants trading off wearing a “Seiya costume” and filling in for him at school while he's sick—with predictably hilarious results. This freedom is easily Amagi Brilliant Park's greatest strength. The show is simply brimming with imagination and it isn't afraid to let it run wild. This is further bolstered by the show's excellent humor—the highpoint of which is Seiya's disbelieving snark and how it plays perfectly off of Sento's deadpan deliveries. While Seiya is certainly the central character of the overarching plot, he is often not the main character on an episode-by-episode basis. Rather, Amagi Brilliant Park is very much a show with an ensemble cast. Some episodes focus largely on developing Sento, the princess, or the mascot characters while another is spent almost entirely on developing the four elemental fairies who act as the park's idols. Another nice touch that stems from the show's ensemble nature is that episodes do not follow the expected formula of “park has a problem, Seiya solves it.” While he is sometimes responsible for an episode’s positive resolution, there are other times when he has no impact whatsoever. Once he is even the cause of a major problem rather than being the solution. By letting the show unfold in this way, the diverse and developed cast has many opportunities to shine. While the freedom to use the setting to its fullest is Amagi Brilliant Park's greatest strength, it is also a bit of a double-edged sword. As so many of the episodes are focused on fun little adventures largely unrelated to the overall plot of saving the park, much of the tension—which should be building as the show progresses—is lost. Indeed, for much of the series the only reminder of the main story is the counter at the end of each episode showing how many visitors the park has received so far. It isn't until the final few episodes that the main plot suddenly becomes relevant again. This isn't to say the ending is handled poorly or even feels particularly rushed—and even though the climatic resolution is foreshadowed to the point of being obvious, it is nonetheless both satisfying and humorous in the extreme. Still it would have been nice to do a little something more each episode that shows the characters are constantly thinking about their impending doom and are doing everything they can to draw in every possible visitor. Of all the shows I watched in the fall season, Amagi Brilliant Park is the anime I found myself looking forward to most each week—simply knowing it'd bring a smile to my face. Few anime are as constantly fun and funny as this one. If you love the idea of humorous adventures with a setting brimming with imagination that's used to its fullest, Amagi Brilliant Park is most certainly worth a watch. 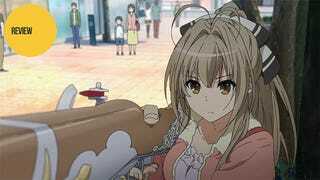 Amagi Brilliant Park aired on TBS in Japan. It has not yet received an official international release. For a second opinion on this anime, check out the review over on our fan-run blog, Talk Amoungst Yourselves.